Scientists have now confirmed that how fracking wastewater injection causes induces earthquakes. 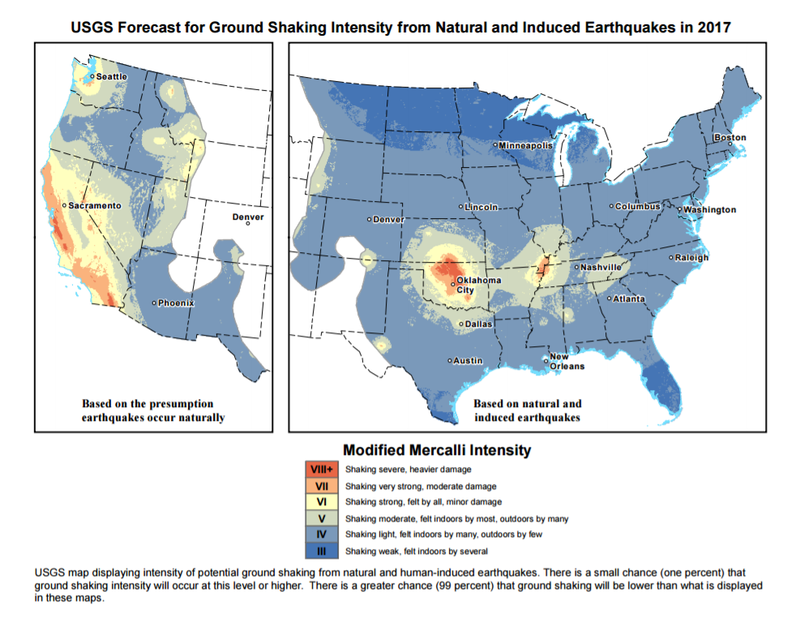 Last year the U.S. Geological Survey released a flurry of reports on the topic of human-induced earthquakes. It is now clear there is a connection between oil/gas extraction and earthquake activity. However, the nature of that connection has been widely misunderstood and misreported, even by some of the most reputable publications in the world. The science of how human activity induces earthquakes is complex and still not fully understood. But the fact that we are inducing earthquakes has been known for a long time. Specifically, the connection between oil/gas extraction and earthquakes has been generally accepted since at least the 1960’s and plainly obvious for about the last decade. Although some politicians may still question the connection, I was building natural disaster models during that time and can say with confidence that science does not. If there was any question remaining, the recent case of Oklahoma should remove all doubt. 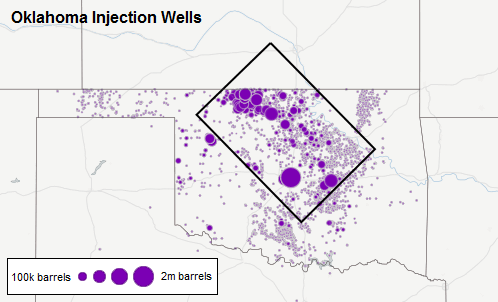 To demonstrate, here are all of Oklahoma’s injection wells, each one sized proportionally to its annual injection volume. As the map shows, most of the activity is concentrated in the northern central part of the state, more or less the region inside the box. This next map shows all U.S. earthquakes of magnitude 3 or greater since 2010. The box over Oklahoma is the same region shown in the map above. In case the map does not make the point clearly enough, here is a chart showing the growth of Oklahoma earthquakes in numbers. Oklahoma has gone from averaging 2 earthquakes a year to averaging nearly 3 earthquakes a day! Oklahoma is the latest and clearest example demonstrating the connection between oil/gas extraction and earthquakes. And along with a few other recent examples of human-induced earthquakes in the central U.S., it has helped science to gain a better understanding of how and why they occur. Only last year did the U.S. Geological Survey feel they understood the phenomenon well enough to incorporate it into their hazard estimation model. It is this new understanding (how and why oil and gas extraction induces earthquakes) that the USGS covered in its series of recent reports. Although many media sources described these reports as verification that oil and gas drilling does induce earthquakes, as mentioned above, the phenomenon has actually been accepted for nearly half a century. 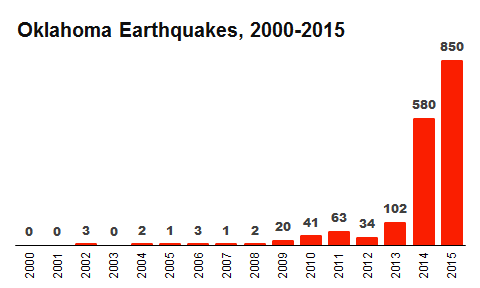 Many of the recent news reports linked the increase in earthquake activity specifically to fracking. However, most human-induced earthquakes in the U.S. are unrelated to fracking. And of those that are, the link is indirect. I think the confusion comes from a misunderstanding of how oil and gas extraction works. There are several cases in which the process involves either taking water out of the ground or injecting it into the ground. Extraction byproduct – Any time oil or gas is extracted from the Earth, it is accompanied by some amount of salt water. The oil and gas is then separated leaving produced water as a leftover byproduct. Fracking – Fracking (hydraulic fracturing) is the process of injecting a high-pressure mixture of water, chemicals, and sand underground in order to break up the rock, freeing the oil and gas that is trapped inside. Enhanced recovery – Enhanced recovery involves flooding the underground rock formations with water or other substances to sweep exposed oil/gas deposits toward the production wells, where it may be extracted. Wastewater disposal – Regardless of the extraction process used, water is a leftover byproduct. The most common method for disposing of that water, which may be mixed with various minerals or chemicals, is to inject it deep beneath the surface, where [in theory] it will not contaminate underground water sources. Of the four items listed above, only d) wastewater disposal is responsible for the vast majority of induced earthquakes. While fracking involves the injection of liquid into the ground, the depth is in general too shallow to induce felt earthquakes. According to the USGS, there are only three reported cases in which fracking itself was responsible for an earthquake strong enough to be felt. Like other forms of oil and gas extraction, fracking induces earthquakes indirectly, when the wastewater byproduct is injected deep underground. Saying that deep wastewater injection causes earthquakes is not technically incorrect. However, cause could be interpreted to mean that humans are creating earthquakes where they would not otherwise occur. An earthquake is the result of two blocks of earth suddenly slipping past one another, as shown in this graphic from the USGS. Before the slip, the blocks are already in motion. But because their edges are bumpy, they get stuck against each other at the boundary. As the blocks continue to push in different directions, the pressure between them gradually builds. Once that pressure grows strong enough to overcome the friction, the blocks slide past each other suddenly, causing an earthquake. When wastewater is injected near a fault zone, it effectively serves as a lubricant, causing these blocks to slip sooner than they otherwise would. Wastewater injection induces earthquakes in the same sense that a doctor induces childbirth. Given the right conditions, they take an event that is already in process and cause it to occur sooner than it otherwise would. However, just as it would be odd to say that doctors cause children to be born, it is not quite right to say that wastewater injection is causing earthquakes. If wastewater injection were causing earthquakes, that would imply a state like Florida, which is not known to have any fault zones, would have good reason to count earthquakes among the risks of oil and gas extraction. In reality, Florida may have many other reasons to oppose oil and gas drilling, but the risk of inducing catastrophic earthquakes should not be one of them. For the reasons explained above, a wastewater injection well is only capable of inducing a felt earthquake if it is located near a moderately large fault and only if that fault has accumulated a sufficient amount of built-up pressure. Of the more than 35,000 wastewater injection wells active in the U.S., only a few dozen have been linked to induced earthquakes. Like many areas of science that overlap with public policy, the science of fracking has been butchered by politicians on both sides. 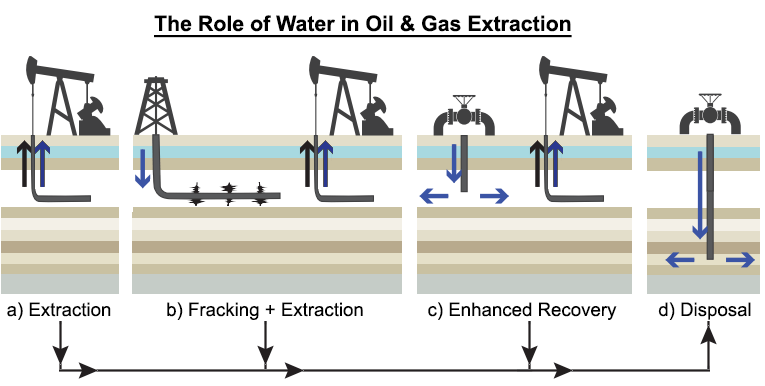 All forms of oil/gas extraction, including fracking, produce wastewater. And disposal of that wastewater underground is what’s inducing the earthquakes. So yes, fracking is responsible, but only as much as every other form of oil/gas extraction. Fracking is only a small piece of the pie. Claims from the right denying the connection between fracking and earthquakes are just silly. Just as silly are claims from the left singling out fracking as the cause. I don’t know whether fracking is good policy, but fake science should have no place in the debate. It might be worth adding a summary sentence to the end of your article to really drive the point home that hydrolic fracturing (in specific) is only responsible for 10% of the earthquake-inducing wastewater disposal and shouldn’t necessarily be demonized as a method for gas extraction, but that all forms of natural gas extraction taken together are responsible for X% of deep wastewater disposal and are ultimately responsible for inducing earthquakes. Yes, you’re right. Made a few changes. Hopefully that ties it up better. I think it’s only fair to note that the underlying energy available to make earthquakes is derived from much larger processes (movement of continent sized plates). The injection does not create any meaningful additional energy in the system, it just releases the energy that is already there sooner, and therefore in smaller chunks. Many small quakes release the energy that would have eventually (though that might be a long time from now) have been released in a larger quake or quakes. Yes, in physics terms, it’s just conservation of energy. And you’re right that it could theoretically be a good thing, releasing the energy gradually, and potentially avoiding a large earthquake in the future. I considered making that point, but decided against it because that benefit is purely theoretical, whereas the risk of inducing a damaging earthquake is a real possibility. The fault zones in OK are inactive, so those ones are probably not accumulating energy. But either way, I agree the recent earthquakes have released some energy. Does that mean the energy would have been released as a bigger earthquake? It’s possible. But it also may have just remained as is for the next million years. Or it may have dissipated gradually on its own. Also, it takes a lot of small earthquakes to equal the energy of one large one, so I’m not sure the amount of energy is significant anyway. If the ones in OK are cat. 3, it would take 32,000 of them to equal the energy of a single cat. 6. I was going to make this point about more gradually releasing seismic energy but then I saw that you beat me to it. Also, it’s important to point out that headlines about drilling inducing “earthquakes” cause lots of people to freak out (“ZOMG, EARTHQUAKES!! !11!eleven!”) because they mentally envision buildings collapsing and so on. It is seldom emphasized that Magnitude 3-ish quakes are down in the “did you feel that?” “feel what?” range.